Thakur's name was proposed by two-time former Chief Minister P.K. Dhumal and seconded by Nadda and another two-time Chief Minister Shanta Kumar. The decision to make Jairam Thakur the Chief Minister of Himachal Pradesh was unanimously taken at the BJP Legislative Party meeting where Union Ministers Nirmala Sitharaman and Narendra Singh Tomar were also present along with Union Health Minister J.P. Nadda and state party in-charge Mangal Pandey on Sunday. Thakur's name was proposed by two-time former Chief Minister P K Dhumal and seconded by Nadda and another two-time Chief Minister Shanta Kumar. Jairam Thakur was born to a Rajput family in Mandi, Himachal Pradesh. He completed his schooling from Government Senior Secondary School Bagsiad. He joined the ABVP, BJP student's wing, during his college days. Thakur completed his MA from Panjab University in Chandigarh. After his education, he joined BJP and entered into politics. Jairam contested in 1993 Assembly polls from BJP ticket but lost after giving a good fight. He won his first Assembly election in 1998 from Mandi. He has been an MLA in Himachal Pradesh Assembly for five times. He was also the minister of Rural Development and Panchayati Raj from 2007-12. He was the BJP party state president from 2007- 2009. In 2013 Jairam Thakur lost the Lok assembly election to Virbhadra Singh's wife Pratibha Singh. His term as a BJP party president is considered as non-controversial and acceptable. Jairam has a strong backing from the RSS and a section of BJP MLAs in Himachal Pradesh. Jairam was previously part of Former chief minister Prem Kumar Dhumal's cabinet. 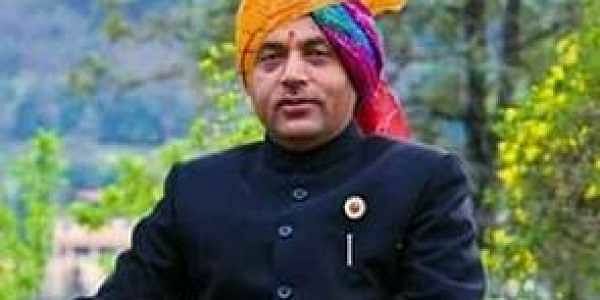 He is the first Chief Minister from Mandi and he is the 14th Chief Minister of Himachal Pradesh. Jairam Thakur is married to Dr. Sadhana, his ABVP colleague. The couple has two daughters.